Imagine staying in a stunning, family owned country house set in a 127 acres of beautiful gourds and gardens. Picture the scene as you and up to 32 of your loved ones gather to celebrate a special occasion or simply be together somewhere special – a country house with stunning reception rooms including a newly refurbished Dining Room, gorgeous new kitchen (for you or the caterers! 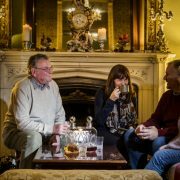 ), large rooms for cocktails and intimate sitting rooms for board games, drinks & relaxing – all with roaring fires. There are gorgeous walks from the door with plenty of space for muddy boots & your four legged friends too. Exclusive hire of The Heath House provides you with a stunning location and beautiful surroundings to be together, celebrate and enjoy while feeling relaxed in a home from home atmosphere. You can self cater in our beautifully new kitchen or bring the caterers in. We are on hand to help you with any arrangements or special requests to help you plan the perfect Country House Weekend.